My feelings about veggie burgers is similar to those about vegetarian chilli. I regard them as completely different dishes than their meat-centric counterparts. Veggie burgers are by no means a substitute for the real thing, but if you perceive them as nothing more than flavorful bean and vegetable patties, they work very well. Of course, they also cannot be those frozen processed hockey pucks they sell at the frozen food section. 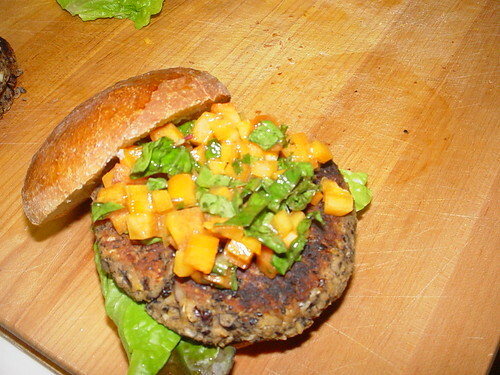 Making vegetarian burgers at home is very simple, much easier than I expected. Armed with a basic recipe from Bittman’s Vegetarian book and several of his variations I made these patties in no time at all. 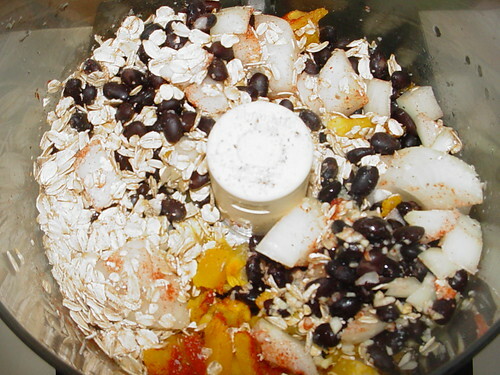 The basic recipe for veggie burgers includes mostly cooked beans of any kind, some old fashioned oatmeal and an egg. Within moderation, all kinds of stuff can be added. Here I added onions, garlic, smoked paprika and roasted pumpkin. 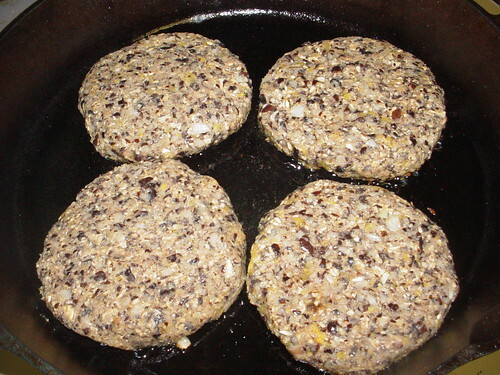 The patties are cooked in an oiled cast iron skillet until crispy on the outside and fluffy soft on the inside. I served them on home-baked buns with Dijon mustard, lettuce and a persimmon relish. A few words about the persimmon relish here. We actually went persimmon picking this past weekend at a local farm outside of Houston. It was a fun day with the kids and we ended up with a few pounds of wonderful sweet and tasty fruit. To make the relish I chopped the persimmon and mixed it with olive oil, lemon juice, basil and mint. Interestingly enough the sandwich as a whole with the crunchy soft patty and the herbs in the relish reminded me a lot of Lebanese falafel. That’s it! Falafel is probably the best and oldest version of a veggie burger. Do you recall the name of the place outside of Houston at which you picked persimmons? Thanks.